There is a saying in American business that recommends if you really want to understand something you need to take a “50,000 foot look” (for those of you on the metric system, that’s 15.2 km). The logic behind this goes something like: if you’re engaged in a battle and need to know how to position your troops, better to be looking down from above than be in the midst of the battle. Exactly where the number 50,000 comes from, I haven’t a clue. 50,000 feet is way above the clouds and certainly would not allow you to see troop movements. If I had made up the phrase, I would have said, “Let’s take a hot air balloon look” above the fray, but close enough to the ground to see what is going on. Anyway, the IMAPS Device Packaging Proceedings have still not arrived (since March! ), ditto on the April ICEP proceedings, and the ECTC is yet a week away. So, I thought we might take “a hot air balloon look” at our industry. Even though you came to this blog to read about packaging, clearly understand that packaging is driven by IC fabrication (the front-end) and that will never change. 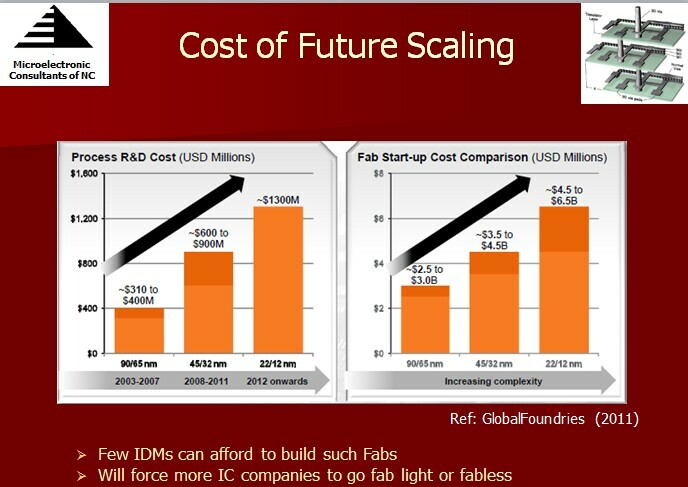 IC fabricators make their big profits on the leading edge node, not on the older, more available nodes. New materials are introduced on the leading edge, and once these processes are locked down (qualified), they are very hard to change. This is why equipment suppliers and materials vendors have always spent much of their hard-earned profits on trying to get qualified into the next generation node products. The End is Coming! Soon. Maybe. Everyone reading this blog understands the “Moore’s Law Coming to an End” arguments. Exactly when it will happen is, to me, less relevant than the fact that it is happening or has already happened for many mid-tier IC fabricators. Some top-tier fabs / foundries will find a way to move forward past 22nm to 14nm and beyond, but the important point is that the vast majority won’t. This is not because the technology won’t be available to them, but rather because it will be too expensive. You have seen my slides on this before. Since it is very important that you understand it, I will show them to you again. 1. 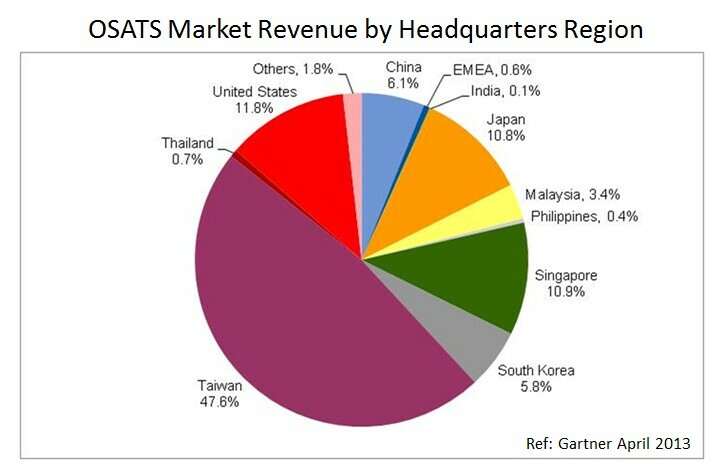 There are only a few companies with enough revenue to justify developing and building $6B+ fabs for 22nm and beyond. 2. There are very few products that have enough volume to absorb the design costs inherent to 22nm and beyond designs. The players that can afford to move forward at this point appear to be Intel, Samsung, TSMC, GlobalFoundries, UMC and Hynix. Maybe one or two more appear through consolidation, but, in general, that’s it. In the future, product differentiation in most product lines will be achieved by the packaging used, not by the incorporation of chips of the latest node. 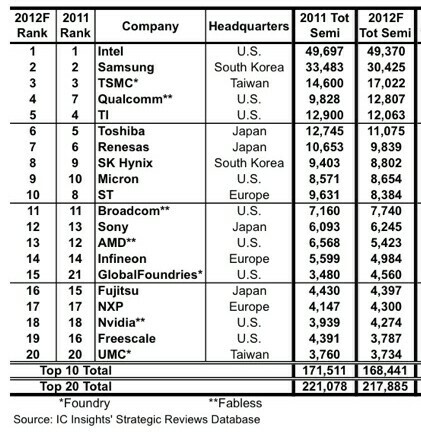 What we are seeing in the industry is TSMC, Samsung and maybe others making a strong move into IC packaging. 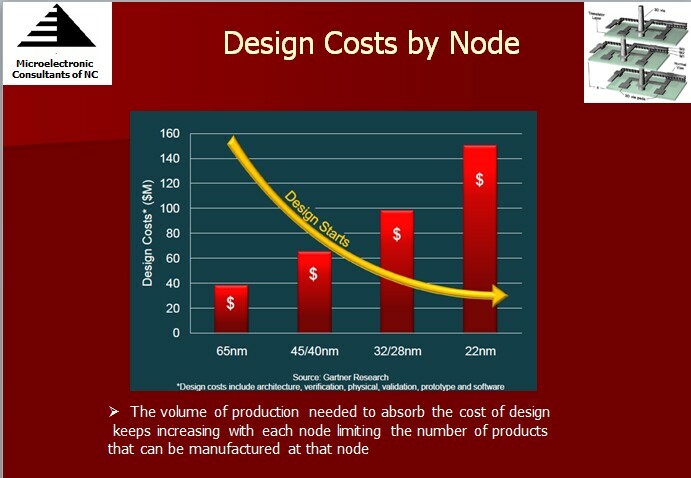 For equipment vendors, the leading edge node customer base is shrinking, and thus you see some of them (litho, 450mm) requiring investments from the IC fabricators before putting money into future node developments. Typical front-end equipment vendors led by Applied Materials, Lam etc. are also acquiring back-end equipment vendors to expand their product offerings. Front-end equipment vendor acquisitions in back-end packaging equipment was, at first, met with skepticism by the packaging community, since front-end equipment has significantly higher margins than back-end packaging can afford. More recently, they have realized that the front-end chip fabricators are moving into the back-end packaging business and are going to their traditional equipment vendors to meet their needs. Material Suppliers Consolidation Coming ? It is only logical that the next round of consolidation will come from the materials suppliers. Materials suppliers have traditionally been quite ignorant when it comes to the actual applications where their materials are to be used. Most blindly follow the roadmaps put out by the industry without really understanding them. In several instances, the low K fiasco of the late 1990s comes to mind. 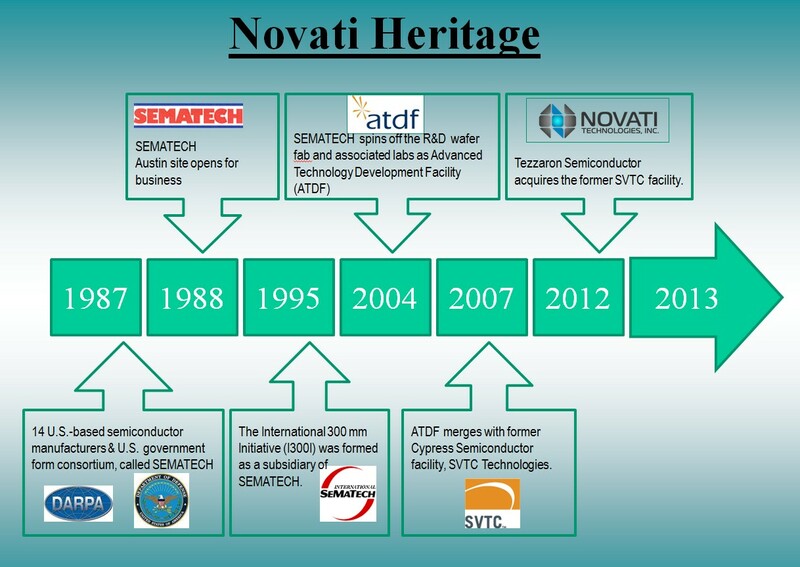 They followed the Pied Piper right over the cliff with many of them loosing tens of millions of dollars, trying to develop spin on polymer dielectrics that were really never going to be used. 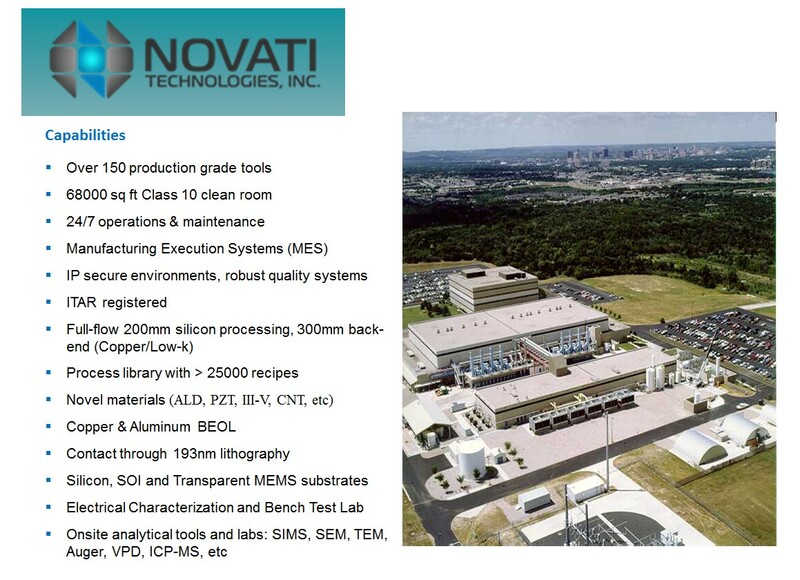 Materials suppliers, once again, need to be very careful when developing for the sub 22nm nodes (on chip or packaging) or for 450mm processes, because the number of companies working on these programs is likely to be significantly greater that the number of potential customers. History tells us that there will only be one or two processes / materials sets chosen by these six-ish players and the potential losses incurred here, by the materials suppliers whose solutions are not chosen, may in fact lead to the eventual consolidations that I predict. In addition, speaking to many fabs and foundries they all appear to be attempting to minimize the number of suppliers they engage as a cost containment issue. I will not be surprised to see old qualified processes trying to replace generic materials with favored vendor equivalents. These are not unusual outcomes; in fact, they are natural for an industry that is entering its “mature” stage, and that is certainly where we are headed. Hope to see many of you all in Vegas at ECTC. For all the latest in 3DIC and advanced packaging, stay liked to IFTLE. 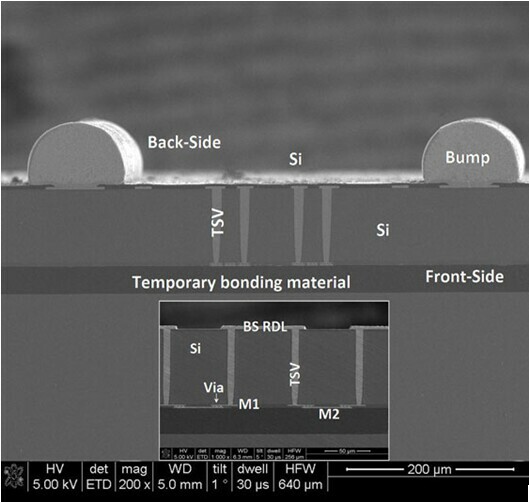 GQ Lo, deputy Director Director of Research, and his 3D group point out that "3D IC…is confronting bottlenecks, such as tools for designing optimal 3D systems and thermal solutions for 3D ICs" and that "2.5D through-silicon interposer (TSI) technology is gaining momentum, both in the foundry and the outsourced semiconductor assembly and test (OSAT) universe." They state that interposer technology provides easier fabrication, alleviates 3D thermal bottlenecks and supports the fabrication of heterogeneous integration. They demonstrate the fabrication and characterization of a 2.67 x 4.3 cm2 interposer on a 300 mm processing line. Processor + memory integration is an ideal 2.5D application since "dies can be heterogeneous (e.g., logic and memory) and can belong to different technology nodes (e.g., 28nm for logic and 40nm for memory, or 130 nm for BiCMOS chips." The TSV (12 µm x 100 µm ) were Bosch etched into a 300mm wafer. TEOS oxide was deposited to isolate the TSV from the silicon substrate; Ti / Cu sputtered as a barrier metal and copper seed. Copper was electroplated, and overburden removed by CMP after copper anneal. Three single-damascene processes were applied to form frontside M1, via and M2 on top of the TSV. ZoneBOND technology was used for wafer temporary bonding and de-bonding. TSV wafer was back-ground to near TSV depth, the remaining silicon substrate was etched to expose the TSV from the wafer backside and low temp dielectric films deposited and CMP’ed. Back side barrier metal and Cu seed were sputtered on the back side dielectric, and the RDL was plated up, patterned and bumped. The cross-section of TSV and FS metal is shown below. ï»¿The electrical performance (C-V and I-V curves) of the interposer was characterized for TSV capacitance (CTSV) and leakage current after top M2 metallization and before TSV reveal. 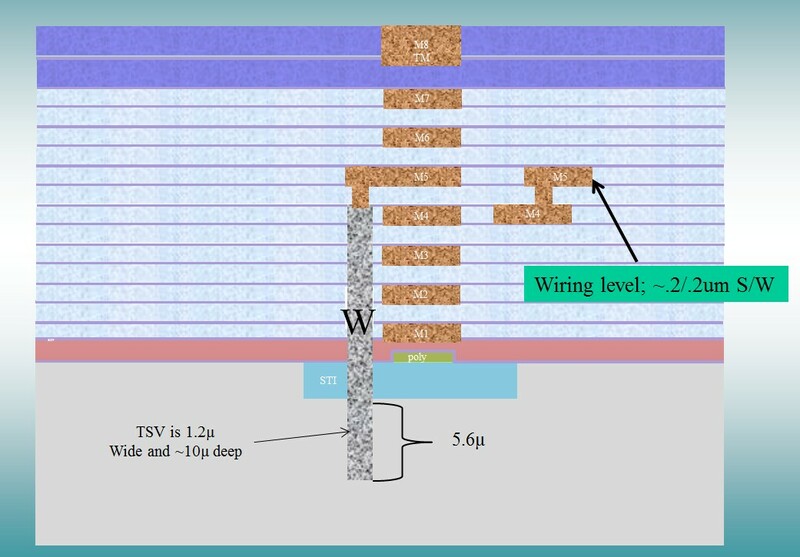 The leakage between four TSVs with connection pad to silicon substrate (measured TSV good dies after C-V characterization) is less than 1 pA for a voltage range 0-100 V, suggesting satisfactory isolation between the TSV and the silicon substrate. The yield of the front side M1-TSV-BS RDL chain and front side M2-via-M1-TSV-BS RDL chain were 90 percent and 85 percent, respectively. At the recent ICEP (Int Conf on Electronic Packaging) in Osaka Japan, Qualcomm’s Umi Ray presented "Architecture Trends in Mobile Industry and Impact on Packaging and Integration," updating their smartphone activities "one device many functions." 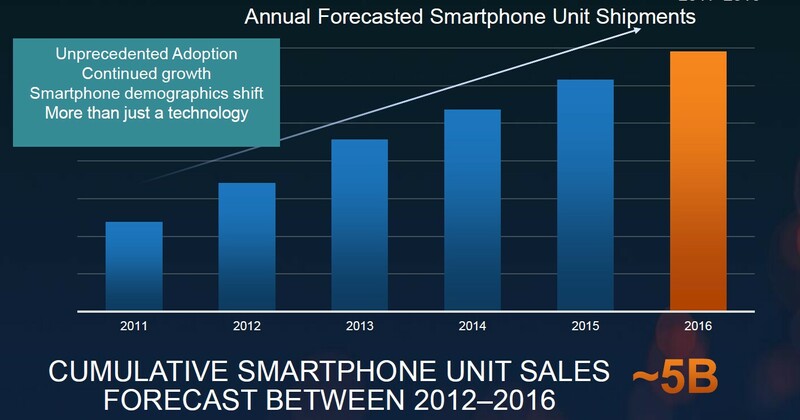 They supported the Gartner projection that 5 billion smartphones will be sold between 2012 and 2016. 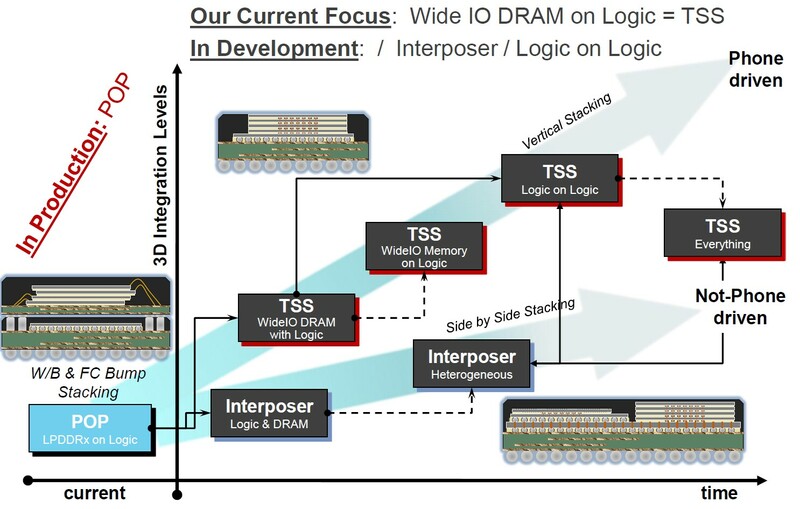 The first implementation target will be wide IO memory on logic and so far, they have seen "no technical show stoppers." As we have discussed in the past, pricing remains the key challenge. You are currently browsing the Insights From Leading Edge blog archives for May, 2013.